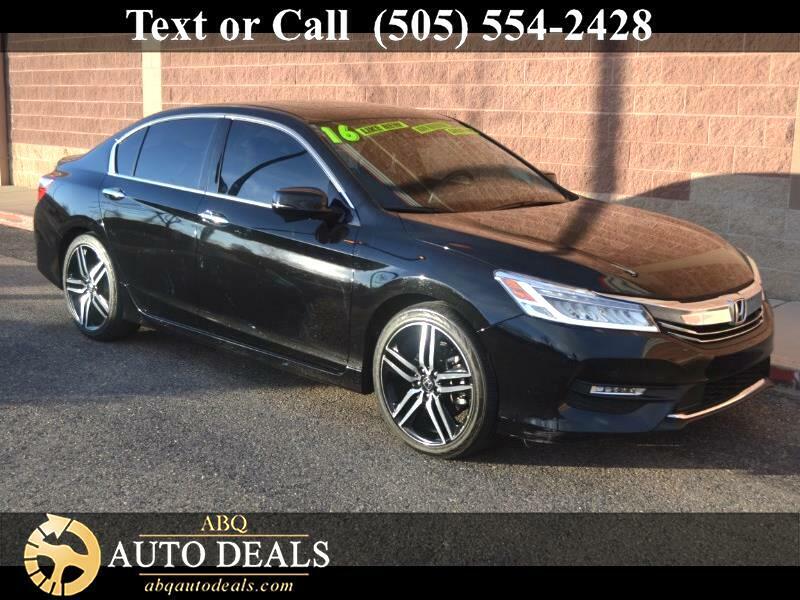 Inject some driving pleasure in your day with our One Owner, Accident Free 2016 Honda Accord Touring Sedan presented in Crystal Black Pearl! Powered by a proven 3.5 Liter V6 that offers 278hp while paired with a 6 Speed Automatic transmission. Our Front Wheel Drive Accord scores near 34mpg on the highway while providing a smooth and responsive drive that continues to earn awards year after year! The sophisticated and refined contours of our Accord Sedan Touring are beautifully enhanced by a distinct grille, a rear spoiler, chrome accents, a power sunroof, and LED headlights. The high-quality interior offers ample passenger space and comfort for all with power-adjustable heated leather front seats with driver memory, push-button start, dual-zone automatic climate control, an auto-dimming rear mirror, a leather-wrapped steering wheel with mounted controls, and a prominent high-resolution infotainment display. It's easy to stay safety connected thanks to HondaLink smartphone app integration, Android Auto, Apple CarPlay with Siri Eyes Free voice command, Navigation, and a terrific touchscreen audio system with CD, auxiliary audio jack, and Pandora compatibility. Our Honda Accord Sedan received top safety scores thanks in part to a backup camera, lane departure warning, lane and road departure intervention, forward collision warning and forward collision intervention with automatic braking. With a sterling reputation for reliability, security, performance and classic style, this is most certainly a wise choice! Print this page and call us Now... We Know You Will Enjoy Your Test Drive Towards Ownership! Your buying experience with ABQ Auto Deals is our number one priority.